500g small beetroot, boiled, peeled and sliced. All you need is a simple salad on the side or even better a potato salad slick with mayonnaise. 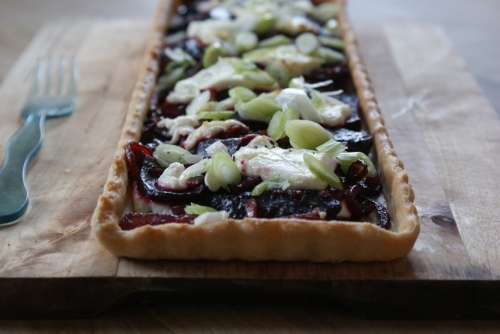 Buttery pastry, sweet roasted beetroot and sharp goats cheese - a trio made in heaven. Preheat the oven to 200C. Line a 24cm tart or flan tin with the pastry and bake blind. Melt the butter in a pan and gently fry the onions until soft. Add the beetroot slices, balsamic vinegar and a generous pinch of salt and pepper. Cook until almost all the liquid is absorbed and the mix is glossy. Cut the cheese into 1cm slices and lay a few on the base of the tart. Tip in the beetroot mix and put the rest of the cheese on top. Bake for 15-20 minutes, until the cheese is bubbling and golden. Sprinkle the spring onions on top to serve.